Today, we announced that Zimbra Collaboration Open Source Edition is moving to Open Source Initiative approved licenses. Specifically, we are moving to the GNU Public License version 2 for the server platform and the Common Public Attribution License version 1 for the web application. We’re absolutely excited about this change to usher in a new era of innovation within our open source community. You can view the Zimbra Open Source Edition License and FAQ at Zimbra.com. Making our source code more accessible to a wide range of developers and community users has been our goal all along. We’ve made source access easier by enabling support for Git clients using Perforce Git Fusion. We’ve tweaked our contributor agreement to be more developer friendly. And now, we’ve made the switch to more commonly known and understood open source licenses. Today, Zimbra has over 60,000 community members, over one million open source server downloads, and an estimated 600 million open source users in 135 countries. With our recent changes, we hope to expand our community participation, drive more innovation into Zimbra’s open source core, and improve the quality of Zimbra Collaboration for the millions of users around the world. 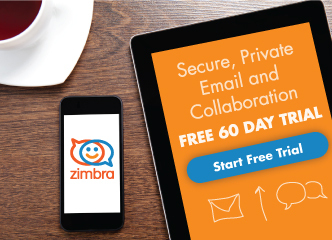 Along with this announcement, we’ve also launched a beta release of Zimbra Collaboration 8.5. I encourage everyone to try the Zimbra Collaboration 8.5 beta and give us your feedback in the community forums. Download the latest version of the beta software and begin using it today! Did You Know? Create a Task from an Email! This step is a big step for all the community and open source users. We really appreciate it, put the code in git is a long time request for users in the community. Also if you want feedback from 8.5 beta, I wrote a quick post about it, testing in iPad as well, etc. That’s amazing news! This is going to drive innovation and ensure Zimbra’s competitivness for many Years. Finally, Zimbra has joined into real open source family. Congrats! Hi Jon, the truth is that adopting this more open new licensing represents a breakthrough for Zimbra and your community, we hope to bring still more of what we do every day, so that in Zimbra may be able to offer the best product on the market, in Spain we are working hard to become the reference platform in collaboration tools, and this step helps us to be able to do even more. Thank you for trust in the community. excited to read about the change to GPL. However took Zimbra 8.5 for a test drive and was disappointed that not even ActiveSync made it into FOSS, given the amount of GPL code and solutions around? Are there any plans to have a version of Network Edition with a couple of free full feature licenses for the nerds of us who like to have their own server with one or two mailboxes to fiddle and do not need 15 licenses? (Like Zarafa, Scalix, etc). That would be truly awesome! Zimbra actually licenses usage of the ActiveSync protocol from Microsoft (http://bit.ly/1hM0tSR). This allows us to support and provide the best compatibility with a wide range of ActiveSync enabled devices. As such though we cannot make Zimbra Mobile (based on ActiveSync) part of the FOSS feature set. The reality is our Commercial version of Zimbra Collaboration funds our investment is the FOSS Edition at the core. To your second question, today you can download the Network Edition trial if you’re interested in playing with some of the commercial features. I know that the trial only lasts 60 days so I’m taking note of your request and see what we can possibly do in the future. We are using Kerio and ActiveSync licence cost 2$ for user per year so buying the network edition is not suppose to be that expensive , zimbra have been sold to yahoo , vmware and now telligent , the product lost market share over O365 and others because the product is to much expensive since day one and mobile sync should not be your way to make money , everyone do it for less money ( google,atmail,office 365 ) so why buy Zimbra ? doc manager ? ( not enough ) , I will tell you what people ask us everyday about email hosting , they want a way to buy 50 regular pop3 mailbox with 25 activesync supported mailbox for the same domain and they don’t want to pay 75 mailbox at full network edition price because its cost the same as exchange so why buy Zimbra ? Give us the possiblity and flexibility to put this product into production with more SMB for less money and they will stay with you when they grow up , Zimbra simply don’t understand the market correctly , there is a need for hybrid product with pop3/activesync support on use basis , every customers I have at our datacenter want this but they finally use pop3/imap because its cost to much , find a way to serve us and the money will be yours not third party plugin makers. Rethink your business case , after 4 owners the price and strategy is wrong , some fresh thinking will just be welcome at Zimbra. Oh ! and the webmail is just well…. a webmail ! IANAL, but I think you need to be more careful about your claims of license compatibility. Your licensing FAQ #3 says that people can release changes as AGPLv3, yet the FSF compatibility link you provide at licensing FAQ #14 clearly states that the AGPLv3 is not compatible with the GPLv2, and even is not strictly compatible with the GPLv3. The language of FAQ #3 is problematic in itself: “… to run the Server in combination with any code with any license that is compatible …” – the GPL specifically states that running the code is not an activity which is covered by the license, so this is wording that needs to be revised, at least in the FAQ. My personal opinion is that you need to release the code under GPLv2 *or later*, not GPLv2 only. This would allow combining with newer projects, a lot of which are released under GPLv3 or later. This is really a great step and its really appreciated one. The license switch is really good news. I’d really appreciate to do it also for IM line. and customizations need to be ported first). But your git mirror is still a mess, practically unusable. (history totally messed up, no release tags, etc, etc). usable!) branch handling, tagging, rebasing, etc. Oh, by the way: where can I get the source for the JP ? I wonder who can ever tell that Zimbra costs as much as Office 365 or more. It depends on a lot of assumptions. That is only true if your mailboxes plus space used by your documents are forever around 50 GB in size per user. If you have ZCS NE on premise and have a barely decent IT department (Zimbra maintanance is quite straightforward if you ask me), the cost of Zimbra is far far less, performances and features are way better than any solution I’ve seen on the market. Of course if you’re ok with an on-cloud solution, Office 365 is usually better. Google is phrasing out ActiveSync, from 2012: “With the recent launch of CardDAV, Google now offers similar access via IMAP, CalDAV and CardDAV, making it possible to build a seamless sync experience using open protocols.” Why doesn’t Zimbra do similar? this would allow the Drafts folder on iOS to work properly (not tied to 365 rules). We actually do support IMAP, CalDAV, and CardDAV. You can set them up on iOS devices, Mac, and any other client that supports them.